Many books state who wrote them. Unless we have good reason to think otherwise, we accept their claim of authorship. The Bible claims to be written by God who moved men to pen His Word. We have seen that we have every reason to accept this claim. But we must eventually ask about other so-called holy books: non-biblical books that also claim to be inspired by God. In particular, what about the Quran or the book of Mormon? Are these also the Word of God? In order for us to know anything at all about God, God would have to reveal Himself to us in some fashion. There are any number of ways in which God could do this. He could hardwire our mind with built-in knowledge of Himself, much as a new computer comes with an operating system already installed. In fact, God has done this; all people know God in some fashion (Romans 1:18-19). The drawback of such internal revelation is that it is easy to suppress because it is subjective. And many people do suppress their innate knowledge of God because they hate Him (Romans 1:18-25). Being internal, such knowledge is not subject to objective inspection by others. Yes, I am aware of my own knowledge of God. But if you deny your knowledge of God, how can I demonstrate otherwise? How can I know that you know God? God could design nature, our senses, and our mind in such a way that when we look at the universe we instantly recognize it as the work of God. Of course, God has revealed Himself in just such a way (Psalm 19:1-6; Romans 1:20). The main drawback of such natural revelation is that it is non-propositional; nature is not composed of words that can be objectively read. People therefore can draw different and incorrect conclusions from their observations of nature. For example, when seeing an animal that is well-designed to kill other animals, some people might conclude that the Creator is cruel, rather than recognizing that the world is cursed because of man’s sin; it was not originally created this way. God could reveal specific truth privately to an individual person, either by speaking to that person audibly, or by communicating directly to his or her mind. In fact, God has used this method to reveal Himself to people (e.g. Exodus 3:1-6; Acts 9:1-5; 1 Kings 19:12-15). The drawback of this type of revelation is that it only benefits the person or persons to whom God spoke and is not open to the objective inspection of others – unless the person wrote down the details. This brings us to the most objective and clear way that God has revealed Himself to humanity: His Word. God did reveal Himself to various people by speaking to them, but He had them write down what He told them so that it is open to inspection by all. Furthermore, God revealed Himself to many different people in this way so that their collective writings corroborate each other. The Bible confirms our internal knowledge of God, and our knowledge of God through nature. And unlike these latter two forms of revelation, God’s Word cannot be suppressed or altered by our wicked desires. As objective, clear, propositional truth, the Bible can correct our understanding of God that we have sinfully distorted from other forms of revelation. We saw previously that God’s written revelation would have to be self-attesting and self-authenticating. It must identify itself as God’s Word, otherwise we would have no reason to think that it is. The Bible’s claim to be God’s Word is evidence (though not proof) that it is God’s Word. Standard procedure is to accept a text’s claim about its authorship unless we have good reason to believe otherwise. This naturally leads us to ask about other books that claim to be inspired by God. Two that people often ask about are the Quran and the book of Mormon. The Quran (or Koran) is the basis of Islam, the religion practiced by Muslims. The book of Mormon is one of several books considered as holy by Mormons, who refer to themselves as the Church of Jesus Christ of Latter-Day Saints. Both the Quran and the book of Mormon claim to be inspired by God. Do we accept their self-claim? In these cases, we have good reasons to believe otherwise. These books are strikingly different from those that God inspired. As one example, consider the way in which these books were written. Recall that God used primarily eye-witnesses to historical events recorded in Scripture, and He used multiple authors so that their writings would corroborate each other. However, the information in the Quran is the work of one man, Mohammad, who did not witness the events the book describes. Likewise, the book of Mormon is apparently the work of one man, Joseph Smith, who did not witness the events described therein. Joseph Smith lived from 1805 to 1844. He was put on trial in 1826 for being a “glass-looker” (a con-artist), which calls into question his reliability. Is the book of Mormon simply another one of Smith’s cons? Smith claimed that he was visited by an angel named “Moroni” in the year 1823, who gave him the location of buried golden plates that contained sacred writings. Smith claimed that he retrieved these plates in 1827, but the angel told him not to show anyone, but to translate and publish them. Unlike the text of Scripture, these plates are not open to objective inspection by others. Instead, we are forced to take the word of a man charged with being a con-artist. The plates were supposedly a record of indigenous early Americans, written in a language that Joseph Smith called “reformed Egyptian.” Smith was allegedly gifted with the ability to read and divinely translate these plates into English. Smith claimed that the angel took back the plates once Smith had completed his translation of them. So we have no way of checking Smith’s translation, and no empirical evidence that such golden plates ever actually existed. This of course stands in stark contrast to the thousands of ancient copies we have of the biblical books in their original languages, subject to objective examination by all. Further, there is no historical evidence for a language called “reformed Egyptian.” In contrast, the Bible was written in known languages: Hebrew and Greek. Unlike the Bible, the book of Mormon has no corroboration from other books written by other authors to its supposed history, and no eye-witnesses to the events recorded therein. This book has none of the characteristics of God’s Word, and instead has all the marks of being the invented fiction of one man. The Quran likewise appears to be the work of one man: Mohammad. He lived from around the year A.D. 570 to 673 and considered himself a prophet of God. As a child, Mohammad apparently had some limited exposure to Christianity and the Bible. He would often go to a cave to pray, and when he was 40, he reported being visited by the angel Gabriel who gave him revelation from God. He then began preaching these revelations to others. Mohammad’s companions eventually wrote down these revelations, which became the Quran. The Quran is divided into chapters called “Surahs” and often refers to God as “Allah.” Unlike the biblical authors, Mohammad did not witness the alleged events recorded in the Quran. And, like the book of Mormon, the Quran does not enjoy the corroboration of other authors. Again, this text has none of the characteristics of divine revelation, and appears to be the invention of one man. So the Quran and the book of Mormon each appear to have an entirely human origin without any factual basis. They are not eye-witness accounts of history. They have none of the properties normally associated with God’s Word. But do these observations conclusively demonstrate a lack of divine inspiration? Can we know for certain that these books are not of divine origin? 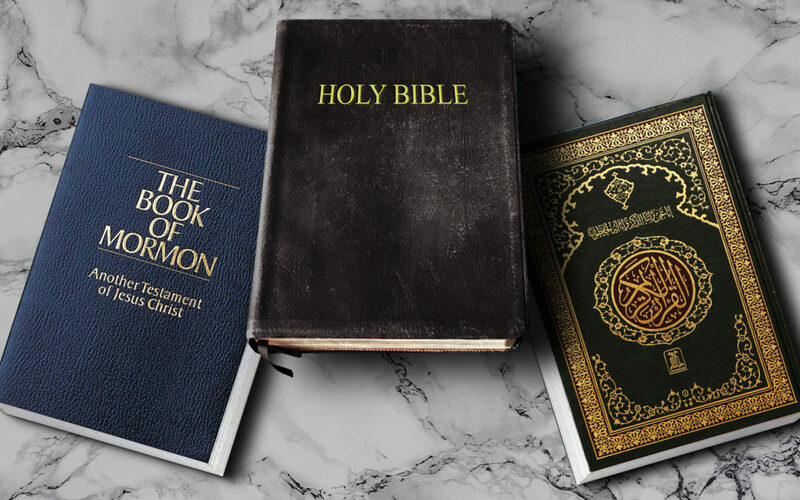 First, note that both the Quran and the book of Mormon endorse the Bible, or at least parts of the Bible. This is significant because the Bible itself provides tests by which we may judge if any particular book really is divine. One of those tests is that further revelation must be consistent with previous revelation (Deuteronomy 13:1-3, Galatians 1:8-9). Obviously, the God of truth will not contradict Himself (2 Timothy 2:13). So, are these other allegedly holy books consistent with the Bible? The Book of Mormon teaches that little children cannot sin because they have no sin nature (Moroni 8:8). Yet, the Bible teaches that people are sinful from birth and even from conception (Psalm 51:5, 58:3). The Book of Mormon teaches that Adam’s fall into sin was necessary in order for him to have children (2 Nephi 2:22-25). This contradicts the Bible in which God commanded Adam and Eve to go and multiply (Genesis 1:28) and to abstain from eating from the tree of knowledge of good and evil (Genesis 2:17), which would be logically impossible if the Book of Mormon were true. Mormonism contradicts the triune nature of God recorded in Scripture. Namely, the Bible teaches that God the Father, God the Son, and God the Holy Spirit are distinct persons (Psalm 110:1; John 5:31-37, 14:16,26, 15:26), yet each of these persons is fully God (1 Timothy 1:2; John 20:28; Acts 5:3-4). And there is one and only one Living God (Deuteronomy 6:4), and He does not change with time (Malachi 3:6). However, the Mormon religion is polytheistic; it has multiple gods. Its founder Joseph Smith publicly claimed that God the Father was once a man like us who then ascended to godhood. Mormons teach that human men too can become gods like the Heavenly Father. This violates the biblical teaching that there is only one God (Deuteronomy 6:4). The book of Mormon fails the test of internal consistency by both affirming and denying the Bible. Contradictions cannot be true, and so the book of Mormon is not from God. The Quran also fails the test of consistency with the Bible. Islam is monotheistic but specifically denies the Trinity (Surah 4:171), and denies that Jesus is God (Surah 9:31, 23:91), in contrast to Scripture (e.g. Hebrews 1:8-12, John 20:28). The Quran endorses much of the Bible including the Gospel (Surah 3:3,48,65, 57:27). But it also contradicts the Gospel in claiming that Jesus was not actually crucified (Surah 4:157). Without the crucifixion and resurrection, there is no Gospel (1 Corinthians 15:12-19). These facts demonstrate that the Quran cannot be part of God’s Word, since it both affirms and denies the Bible. By the law of non-contradiction, anything that simultaneously affirms what it denies is necessarily false. The Bible requires that additional revelation must be consistent with previous revelation. The Quran is not. The Quran bears every evidence of being the opinions of one man. Mohammed had been exposed somewhat to Christianity, but his misunderstandings of it are revealed in the Quran. For example, the Quran mistakenly identifies Mary (the mother of Jesus) as the sister of Aaron (and Moses) and daughter of Imran (Surah 19:27-28, 66:12). It seems that Mohammed had confused Mary with Miriam, who lived 1400 years earlier (Exodus 15:20). God would not make such a mistake, and therefore the Quran cannot be part of His Word. It is not consistent with the Bible. As another example, the Quran not only explicitly denies the Trinity, but misunderstands the Trinity. The Trinity affirms that there is only one God (who exists in three persons). Yet, Mohammad apparently believed that Christians (“People of the Book”) actually believed in three Gods, that the Trinity meant that Jesus is a different God from the Father. But no Christian believes in three Gods. Christianity is a monotheistic Faith. Mohammad clearly misunderstood the Trinity, and was criticizing his misunderstanding of the Christian position. God would not make such a mistake. Note that the Quran specifically denies the divine nature of Jesus in this passage, saying that Christ was “no more than an apostle of Allah.” Again in Surah 9:30 the Quran states, “…the Christians call Christ the Son of Allah. That is a saying from their mouth; In this they imitate what the Unbelievers of old used to say. Allah’s curse be on them: How they are deluded away from the Truth!” Yet the Bible affirms the deity of Jesus throughout (John 1:1-3, 8:58, 20:28; Philippians 2:5-11; Hebrews 1:8-12; 1 Timothy 1:2). The Bible was written by multiple authors who were eye-witnesses to the events they recorded. Their consistency verifies that the Bible records real history. Archeology confirms this as well. But Mohammad did not witness the events of the Bible. Likewise, Joseph Smith lived thousands of years after the supposed history contained in the Book of Mormon. He was not an eye-witness to any of the things he wrote. And no other eye-witness accounts confirm any of the events described therein. There is no historical evidence that anything described in the Book of Mormon actually happened. Moreover, there is no archeology to verify these stories. Archeologists consult the Bible when they want to know where to dig. They do not consult the Book of Mormon. The Bible really is unique in the ancient world. We have seen that it is authentic far and above all other ancient literature. It is uniquely corroborated by multiple authors spanning a time period of 2000 years. Many of its reports have been verified by archeology. It is a book of history (and more) that claims to be divinely inspired. There are other accurate history books that do not claim to be divine, and other books that claim to be divine but lack accurate or verifiable history. The Bible stands out from other literature as the unique Word of God. But how do we know which books specifically belong in God’s Word? Why is the Gospel of John included in the Bible, but not the “Gospel of Thomas?” And what about the Apocrypha? More to come. Nonetheless, they demonstrate their internal knowledge of God by their awareness of His moral law (Romans 2:14-15). The other books considered holy by Mormons are the Bible, the Book of Doctrine and Covenants, and the Pearl of Great Price. The latter two, along with the book of Mormon were written by Joseph Smith.